I love visiting Vang Vieng. Since 2007, I’ve been to Vang Vieng four times and still haven’t seen it all. After a bus ride from Vientiane, Laos, it was nice to sit by Nam Song River and enjoy the beautiful landscapes and treating myself to a big lunch from Ban Sabai Riverside Restaurant. Some people might be put off with the town being like a Disney World for backpackers but I still like the charms and the people of the town. As long as I don’t hang out at certain places, Vang Vieng is a good place for me to take it easy, enjoying good food and good company. 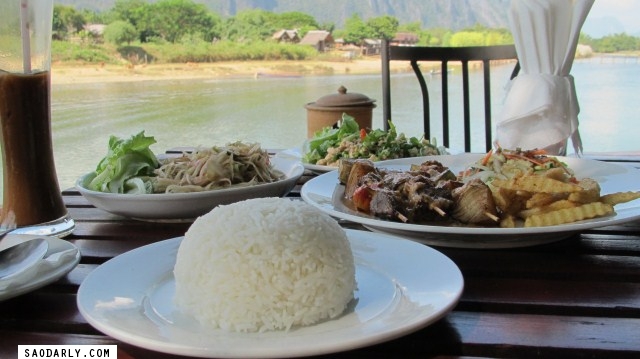 Eating breakfast, lunch, or dinner by the riverside is recommended. Just check out the great view of Nam Song River and watching life as it is and you just might want to experience Vang Vieng, the Lao way of course. As I’m typing this I heard on Lao National TV about the heavy rain in Vang Vieng for the past couple of days and flooding around town. I hope no one is hurt and they’ll be able to recover from this natural disaster soon. This is really funny. I looked up Ban Sabai, and found out that not only have I stayed there, but the most of the pictures on their website were taken by me. The owner of the group that manages this place is a friend of ours, and he took me to VV some years ago to do publicity pix for him. Dorothy and I stayed there for a few days, too, in 2005 I think. Nice place, well away from the mad circus of bacpackers watching “Friends” and getting stoned in the centre of town. Back then Ban Sabai was one of the few upper places you can stay and be away from the noises. Now there are more competitions for the same prices. Ban Sabai is still a nice place to stay and they remodeling when I was there in 2010. Perhaps you have enough of Vang Vieng? It’s not for everyone but I still like to go there and to just roam around and talking to the local people. If/ when you’ll go back to Vangvieng, let me know and i’ll recommend you the best places in and especially out of town. I have lived in in Vangvieng for two years and still visit twice a year.